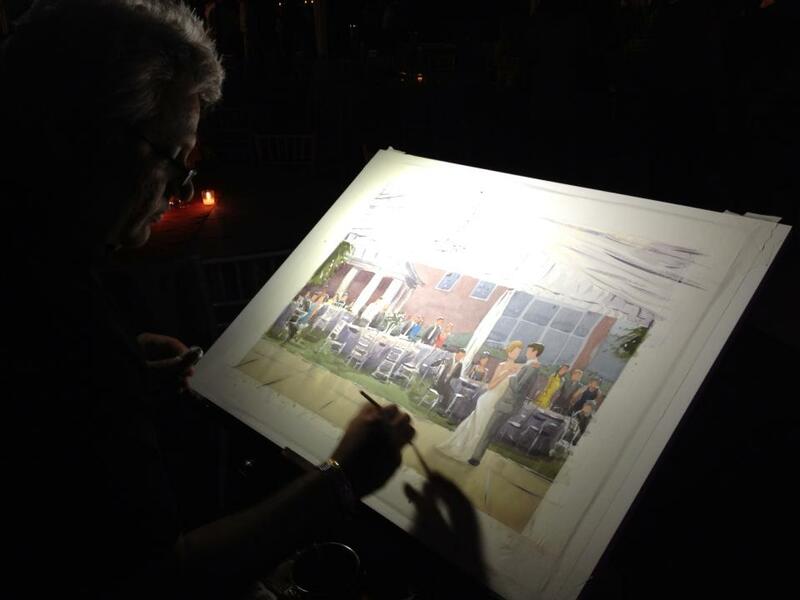 This was my first time painting live at the Berry Hill Resort in South Boston, Virginia. What a beautiful venue! And it was a perfect day for Lauren and Brad’s wedding. I was commissioned by Lauren’s parents. 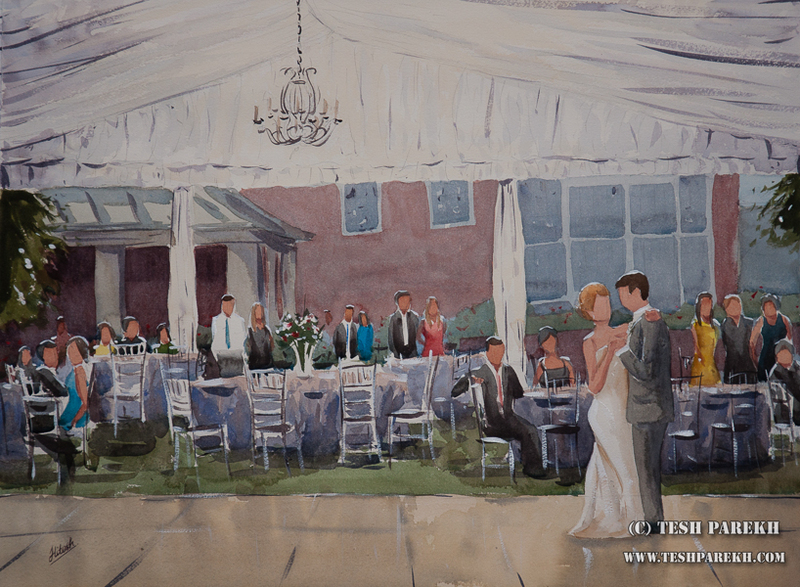 Lauren had requested 18×24 watercolor painting of the couple’s first dance. I enjoyed working with Nicole Conder of Premier Party Planners. This wedding was filmed by Amanda Pagano of Isabel’s Corner Videography and photographed by Abbie Franklin of Elite Carter Photography. I look forward to seeing their beautiful work. I arrived well ahead of the scheduled first dance. I setup next to the live band- GrooveTown Band. 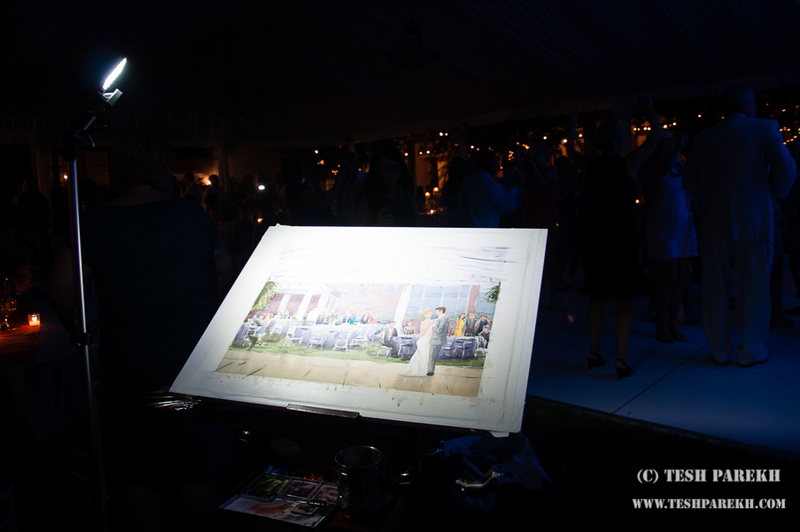 Live painting next to the live music! The weather was beautiful. I had a good view of the dance floor but did not like that as a composition. So, I walked around to find a better composition. Here is my setup- I stayed in this spot but painted a different perspective. This being an outdoor reception, the light will continue to change. This being a watercolor, I stated with the drawing. I sketched in the background while waiting for reception to start. Once the guests arrived, it got busy! The reception was on the schedule. I made reference sketches during the first dance and also snapped couple of photos for the reference. 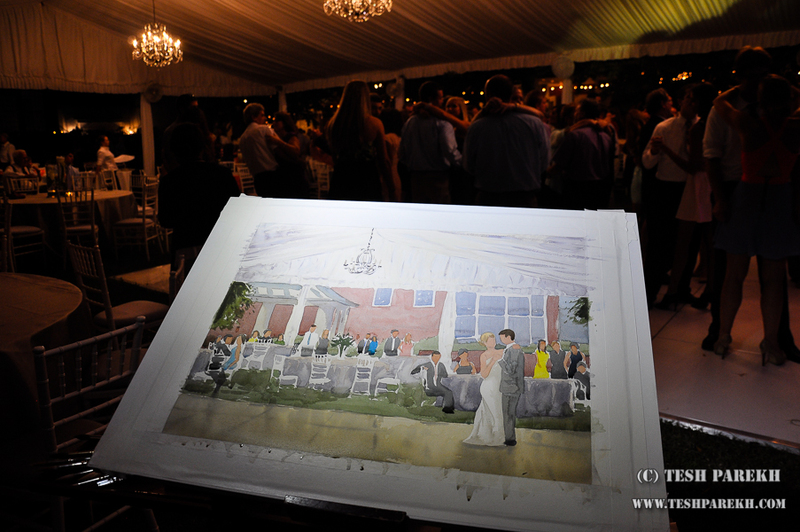 I also made reference sketches of guests enjoying the first dance. Then it was time to combine all the visual information on my painting. I tightened my drawing. The next phase was color washes. I enjoyed chatting with guests while I painted. Here is my painting in progress. As you can see, the light has changed dramatically! But, I maintained the view as I remembered during the first dance. The painting continued to evolve. Lauren and her parents stopped by to review the painting and were very pleased! I enjoyed meeting all of them in person. 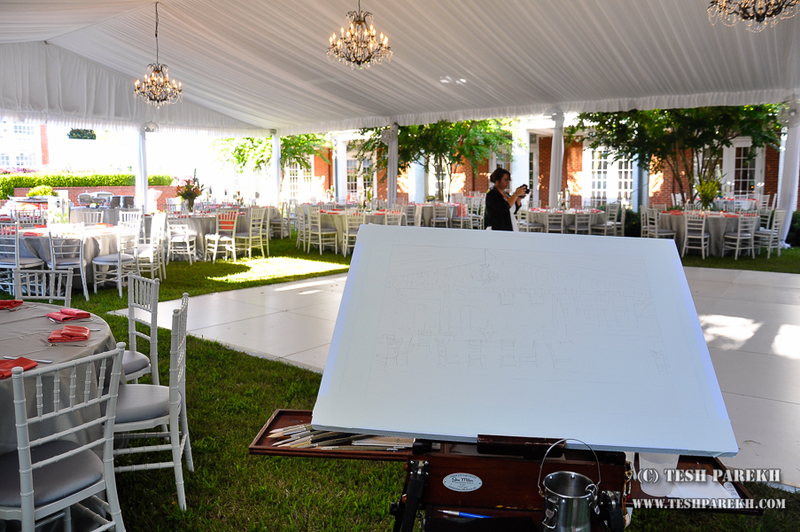 I thank Steve Anderson for giving me opportunity to paint at Lauren’s wedding and I appreciate his kindness and generosity. I applied final touches to finish the painting. Here is my finished painting on the easel. I photographed the painting and presented it to Nicole for safe-keeping. And then it was time to head back to Raleigh. Lauren & Brad’s First Dance. 18×24. Watercolor on paper. For a representational style of alla prima painting, this was a rather large commission. I enjoyed the challenge.